Catholic bishops in Cameroon have disputed the results of the Oct. 7 presidential election in the country. The official results were released on Oct. 22 and declared incumbent Paul Biya the winner with 71 percent of the vote, with his main challenger, Maurice Kamto, only receiving 14 percent. Biya’s ruling Cameroon People’s Democratic Movement (CPDM) party has been accused of massive electoral fraud to keep the 85-year-old leader in office for another seven years. Biya is Africa’s longest serving president, having entered office in 1982. In the latest election, he was challenged by seven other candidates. In an Oct. 23 press conference, the president of Cameroon’s bishops’ conference, Archbishop Samuel Kleda, said serious questions needed to be asked with regard to the outcome of the ballot. “This election led me to ask questions,” the archbishop told journalists in Douala. He noted the large turnout for the president in the Far North Region of the country as being particularly suspicious. The region is home to the worst poverty levels in Cameroon, with 74 percent of the people living below the poverty line compared with 37.5 percent nationally, according to the International Crisis Group. “I don’t see up to 89 percent of people going through such suffering voting for the same person who has been there, doing nothing about the hardship of the people…the far north is one of the poorest and most undeveloped regions in Cameroon…I am seriously puzzled by those figures,” Kleda said. “This means that all the problems we were looking to resolve before the election will not be resolved.” he added. 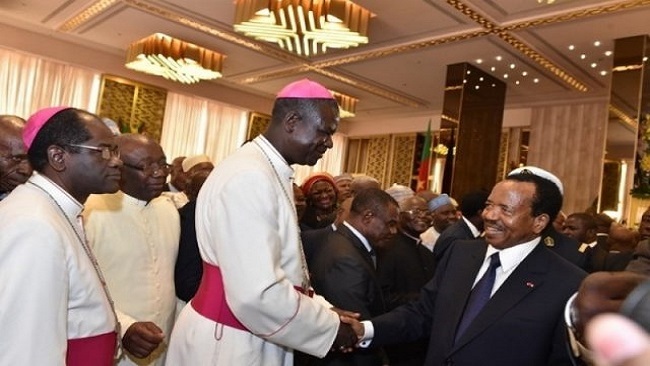 The archbishop also questioned the declared victory of Biya in the troubled North West and South West regions. These are the Anglophone areas of Cameroon and have been engulfed in violent clashes dating back to October 2016. Teachers’ and lawyers’ strikes over perceived attempts by the francophone-dominated administration to destroy the Anglo-Saxon-educational and legal systems practiced in Anglophone Cameroon mutated into political demands for independence by the Anglophone minority. Kleda noted that the fighting in the two regions had displaced large numbers of people who couldn’t therefore vote. “At a time when it was impossible to campaign in the two regions, where are all these figures coming from?” Kleda asked. Kamto, who claims the election was stolen, has called for the annulment of the results in seven of Cameroon’s ten regions, citing cases of massive fraud. “If I am declared winner of this election, I will decline to be sworn in because I cannot be president of only one part of Cameroon,” Osih told the country’s Constitutional Court. Kleda complained about what he called the “hasty ruling of the Constitutional Council” in declaring the official results. “I think all the candidates, Kamto, Cabral and Osih had a strong case and proofs to show there were irregularities, especially the petition of the SDF [the main opposition party] on the North West and South West Regions where few people voted…They had to listen to them… Cameroon is a country with the rule of law, the council kept rejecting all the petitions based on technicalities which was not normal,” the archbishop said. Kleda then dismissed the results as prefabricated saying it was a trend in the region. “One has the impression that in the Central African sub region, election results are decided before voting takes place,” he said. The Emeritus Archbishop of Douala, Cardinal Christian Tumi, a virulent critic of Biya, surprisingly took a more conciliatory tone. “I would say only one thing: let’s take everything as God’s will, because no one wields power on earth which doesn’t come from God. Those who govern us will render account of how they governed us to God. So, let’s not create problems for them. Let’s accept (the results) and wait for another occasion to choose another person,” the cardinal said. The bishops are considered by many to be a key to peace in the country, which is 40 percent Catholic.